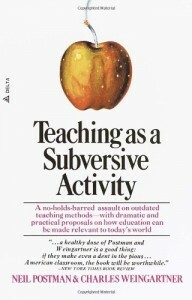 Are you a subversive teacher? A teacher is that rare individual who coaxes the existing knowledge systems of his students out of hiding, drags every last tentacle of the monster from the depths into broad daylight, hoses off the slime, wrestles it to the ground when it puts up a fight, and finally gives it a heart transplant. That’s subversion. That’s teaching. This could be about curriculum. The teacher MUST teach the book but it is awful and boring. So the teacher is subversive and covers the book quickly while providing creative, effective instruction for students the rest of the time. The teacher brings the hidden curriculum to the fore but in a quiet, “unofficial” way. This could be about assessment. The teacher MUST assess students but is not given the time or maybe has to use high stakes methods which really don’t give a good indication of the student’s effort, progress. So the teacher fudges the numbers and blends things – making sure that those students who don’t fit into the regular testing mould – get their due. We might not go so far as Robin Williams and have students rip out the thoughts of J. Evans Pritchard but good teachers do similar things. Teachers subvert. In our discussions we always talk about how we smile, nod and keep things pretty while doing some other things which we really know will help students learn. It is our classroom after all, despite all other pretensions. Good teachers know how to be subversive. Not in any rebellious or revolutionary sense but in a quiet way, a subtle way. Without teachers doing these subversive things every day, I don’t think there would be a lot of progress in “official” education. I really do. Partly it is a coping mechanism but mostly, it is teachers being true to the real spirit of education which isn’t “a book” , “a curriculum” , a competition” but rather connecting with learner’s and motivating them to discover, to learn. Two books that have influenced my thinking are now classics and they speak in a similar vein. 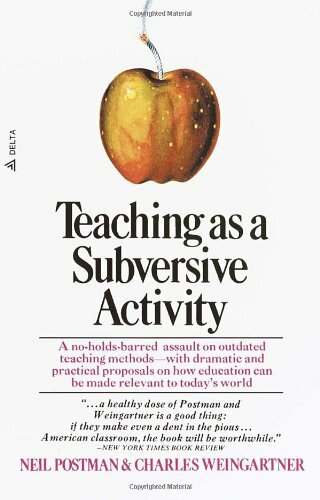 Postman and Weingartner’s, Teaching as a Subversive Activity and Illych’s – Deschooling, I highly recommend both. They still apply today, these ideas of slowly changing the system through what we do in our classrooms, in education. (I especially love Postman’s thoughts about Teacher’s College and designing curriculum). Great post. I think that Pedagogy of the Oppressed is required reading in this area. I’m not a 100% believer in Freire’s theories/opinions, but it really does make one think about the role of the teacher and the relationship between the teacher & establishment and the teacher & students.